Name Idea: In commemoration of Archbishop Eris O’Brien, eminent Australian historian and Archbishop of Canberra-Goulburn, who invited the Missionaries of the Sacred Heart Fathers to establish a school in Canberra in 1962. Colours: Gold and white – the Papal colours. House Flag: White to mast with dolphin symbol; gold trailing. Flag is pennant shape. Arms: Dolphin-symbol of Risen Christ. Ring – Ring of Peter the Fisherman – ring of Episcopal authority. 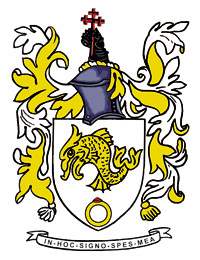 Crest: Recalls the O’Brien family motto. Strong arm above.